One flight up, in a bustling neighborhood bistro overlooking the chaos of one of downtown New York’s busiest streets, Ignacio Mattos serves food so uncannily delicious it consistently earns him accolades like “Chef of the Year,” and his restaurant Estela a spot among the World’s 50 Best. Everyone wants a taste of Estela, from loyal local customers to out-of-town foodies, visiting chefs to visiting presidents. The food is bold, bright, layered, playful, and surprising. Innovative without being precious. Comfort food, really. Food that bursts to life in your mouth—food that hits you right there. 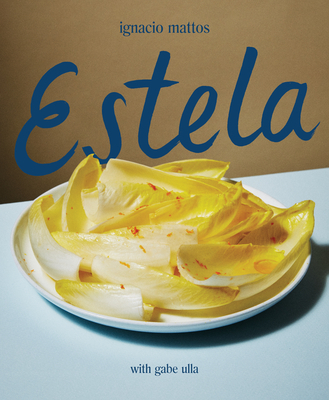 Estela, the long-awaited cookbook, shows how to think like Ignacio Mattos, who as an immigrant sees ingredients with fresh eyes. Here is how to look at something as ordinary as a button mushroom and make it extraordinary (shaved thin over ricotta dumplings), or as familiar as burrata and transform it (with a pool of juiced herby greens and charred bread). How to use vinegars, citruses, fish sauce, and pickling broth to give each bite a pop of flavor. How to compose a plate in layers, so that the deeper you dig, the more that is revealed, while each forkful carries an electric marriage of flavors and textures. Estela presents over 133 recipes, including classics that will never leave the menu, like Lamb Ribs with Chermoula and Honey, Mussels Escabeche on Toast, and the hide-and- seek joy of Endive Salad with Walnuts and Ubriaco Rosso. Small plates meant for sharing with friends and family, like Cherry Tomatoes with Figs and Onion. Incredible pan-seared steaks. And basics for the pantry that will elevate whatever you feel like making. Estela is the restaurant, but Estela is far more than a restaurant cookbook. It’s an inviting and creative expression of Mattos’s fresh and influential style. Ignacio Mattos grew up in Uruguay, worked with Francis Mallmann, built his skills at Zuni Café and Chez Panisse, and was the chef at Il Buco in New York for five years before striking out on his own. In addition to Estela, he owns Café Altro Paradiso and Flora Bar and Flora Coffee at the Met Breuer, all in New York City. Find him on Instagram @estelanyc and @ignaciomattos. Gabe Ulla is a New York–based writer who has collaborated with a number of noted chefs and contributed to publications including WSJ Magazine, Saveur, and Town & Country.